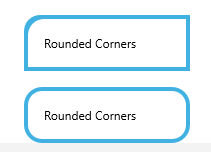 BorderThickness and CornerRadius are now defined by a Thickness. To get a better performance for uniform borders a fallback to old fast rendering is in place. Why there are two identical if-else branches? Good catch. Those checks are not needed anymore. Shouldn't it supposed to be innerRect inside if? Fast rendering needs some improvment dont know how yet. The inner corners dont match if you have a CornerRadius > 0. In my faster rendering path i just take the same radius and it looks smooth. FillRectangle and DrawRectangle seem to produce diffirent rounded corners. Microsoft checks for UseLayoutRounding and calculates everything in terms of ui scaling (DPI). Should i do the same and how do i do that? Everything about scaling is private. @Gillibald the layout rounding should have already been applied by the layout pass, so the control should be snapped to pixels. This is done here. Is it that you want to also snap the border thickness to pixels? To get the layout scaling for a control you can copy this method: https://github.com/AvaloniaUI/Avalonia/blob/master/src/Avalonia.Layout/Layoutable.cs#L698 - it may be something we need to expose publicly, but for the moment just copy it into your codebase and see if it solves your problem, we can look into exposing it once we know it's needed. Looks like with the current complex render path all pixels are already snapped to boundaries. I no longer use a Pen in my DrawGeometry call. Don't know why a brush is different but for now it is enough. Only have tested Direct2D maybe other Frameworks behave differently. Added a few small comments (mainly nits) in the code. The first border above has a CornerRadius="16 0 0 0" and the second CornerRadius="16", however the corner on the top left of the first border doesn't look the same the corners on the second border - it looks "fatter". Any idea why this is? Also we should probably have some more render tests to test this new functionality. Why the change here? result is a double, so == is what you'd usually use to compare. Wasn't sure about rounding errors but I will revert it. Usually it should do the same. I wasn't aware of any differences between double.Equals and ==, are there differences?!? I think I'd rather have this class moved out of Border. Maybe put it as an internal class under Utils? Will have a look at present render tests and create new ones to represent my additions. That way we can make sure everything looks as it should be. What does a NaN as a portion of a CornerRadius mean exactly? Good catch. Can't think of a case where we need NaN. I should probably check for NaN and throw an exception. Is NaN allowed for Thickness? Have to check that first. Should probably delete this line rather than commenting it out. Couldn't this block be written more succinctly as: return Geometry.GetWidenedBounds((float)(pen?.Thickness ?? 0)).ToAvalonia();? I usually do that wasn't sure about readability and code style. Will have that in mind for the future. Thanks for your feedback will have a look at it soon. Looks like my background geometry needs some tweeks. I probably need to use a percentage of the outer corner radius for the inner. Should be manageable. Render tests are still missing. Probably need some help there. Added a couple of Border CornerRadius render tests. Apologies for the delay reviewing this @Gillibald - looks good to me now! I added a couple of render tests. Once CI has passed I'll get this merged. Thanks for your help. Can we check ContentPresenter before merging. Wasn't sure how to test measurements. ArrangeOverrideImpl has some changes I wasn't sure about. Sure! What in particular were you unsure of? Before my changes just the uniform BordeeThickness took part of all calculations. Now I'm am using all 4 sides. Ok, looks like the best thing there would be to compare with UWP's behavior then. I won't get chance to do that this evening, but I will try to take a look tomorrow! Maybe I have to spend some time with that part myself. Padding is handled only with Left and Top part. Have to check some ContentPresenter examples and make sure all measurements are fine. Thanks for your help in advance. Looks like everything is fine with ContentPresenter. Couldn't find anything unusual. So in my opinion we are ready to merge. I will give this another quick test on AvalonStudio this evening. @danwalmsley did you give it a test? Are we ok to merge? Thanks @Gillibald ! @danwalmsley has given the 👍 on this in gitter so merged!